Helianthemum nummularium, aka Sunrose or Rockrose, is a semi-woody perennial sub-shrub or ground cover. Sunroses are originally native to the Mediterranean region, but have been in horticultural production for quite some time, with many cultivars available on the market. They are distantly related to daphnes, hibiscus, hollyhocks and okra, among other plants. 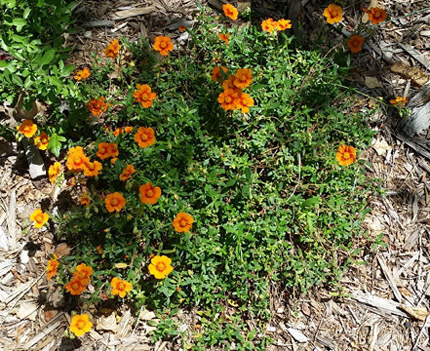 As the latin genus name suggests (Helianthemum translates to “sun flower”), these plants grow well in sunny, dry locations, but we’ve also had good results with using them in partial shade. Luckily for us gardeners here in Colorado, this plant also prefers alkaline soil. This low-growing perennial provides a delightful floral display starting in late May. The profuse blooms hover over a thick mass of low branches that carry small, oval shaped leaves. The flower color is available in shades of red, orange, yellow, pink and white. Perfect for a rock garden, sprawling over the edge of a wall, or in a hot and sunny border area. The silver leaved varieties are semi-evergreen in winter. Cold Hardiness Zone: USDA zones 5 – 9 (up to 6,000 ft). In colder climates, Sunroses may overwinter more successfully with a mulch covering. Silver leaved varieties overwinter better than green leaved ones. Water Requirement: Drought tolerant once established. Silver leaved varieties are more drought tolerant and establish sooner than green leaved varieties. Seem to be able to take poor soils very well, and we’ve had good luck is slightly wetter soil as well- very adaptable. Exposure: Full sun to part shade. We’ve actually had good luck using these plants under trees where there was quite a bit of shade, but full sun will produce the most flowers. Soil: Sunroses prefer dry, alkaline, rocky or sandy, well-drained loam. Flower Color & Bloom Time: Various colors are available: white, yellow, orange, red and pink. Blooms May to June. Disadvantages: Roots rot easily in poorly drained soil. Plants don’t do well in prolonged wet soil during winter. Availability and Sizes: This plant seems to be regularly available at retail nurseries around the front range. It is typically sold in 1 gallon or 4″ pots. Best Features: The many beautiful flowers that cover this plant when in bloom. The evergreen foliage is also charming when the plant is done blooming. Maintenance Tip: Prune off old, woody growth in spring. After flowering, the plants may be cut back to encourage new growth. Don’t prune after summer; plants must be allowed time to harden off prior to winter. Plants may be divided in spring (prior to flowering) every 4-5 years.